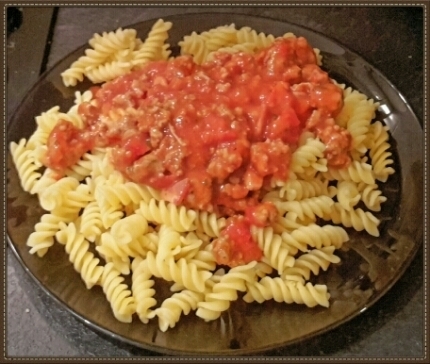 A quick and easy recipe for sausage and bacon pasta (you could also use spaghetti). Cook the pasta / spaghetti according to packet directions, usually 10 minutes in a saucepan of boiling water. Drain well and set aside. Cook the chopped bacon in a frying pan till crisp, drain the excess fat and remove from the pan. In the same pan, cook the sausages. Once cooked remove the sausages and cut into pieces, put back in the pan along with the bacon and pasta sauce. Add herbs (I used Schwartz mixed pasta herbs) and cook for approximately 10 – 15 mins. Serve with the cooked pasta / spaghetti, I add some grated cheese to the top (not shown in photo).